Caravana por la Paz con Justicia y Dignidad - U.S.A. The directors of the Angelica Foundation met Javier Sicilia, the Cuernavaca-based poet and professor, in 2012. After the murder of his son, Sicilia announced he would give up writing poetry to voice the collective nature of his pain and to give space to the voices of tens of thousands of other victims of Mexico’s futile war. Sicilia led two Caravans throughout Mexico, one through the south and one through the north. Hundreds upon hundreds of bereaved families stepped forward, breaking the long-held silence about the ravages of the drug war upon their families and communities. When Sicilia announced his attention to bring Mexico’s victims movement on a tour of the United States – the wellspring of drug prohibition and militarization of its enforcement, the source of thousands of weapons that make their way into Mexico every year – Jim and Suzanne stepped in to support and help organize this incredibly ambitious bi-national grassroots campaign. 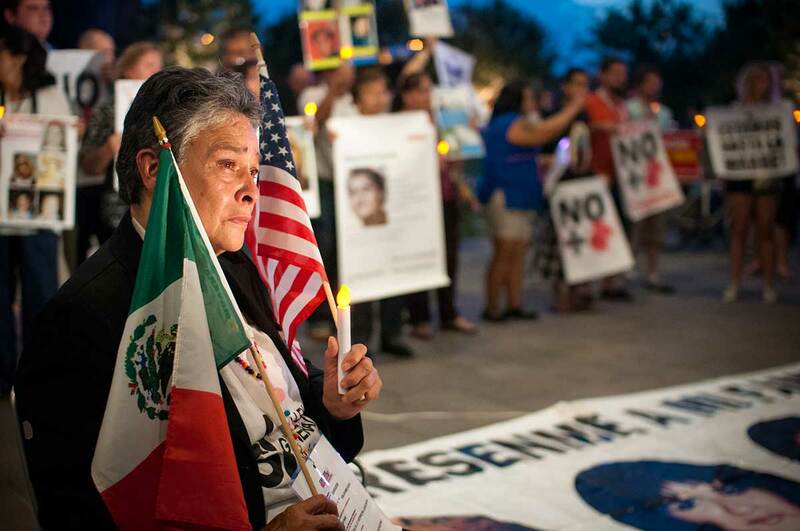 In mid-August 2012 the Caravan for Peace with Justice & Dignity — led by the mothers, fathers, sisters, and brothers of Mexicans murdered and disappeared during the drug war — began its sojourn across the United States. Starting from the Pacific shoreline where the wall dividing the U.S. from Mexico meets the sea, the 120-person caravan traversed 5,700 miles, holding events in 26 cities and generating extensive coverage in most of the major media markets in the U.S. and Mexico. 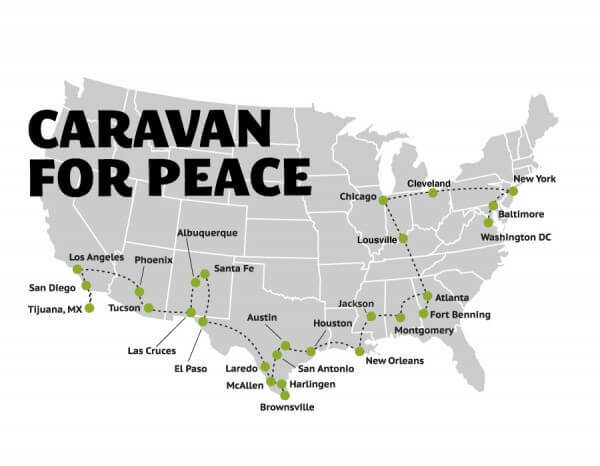 In the first half of its tour, the Caravan proceeded from the Tijuana/San Diego border through “papers, please” Arizona, New Mexico and Texas. In these border states, the Caravan focused on the impact of the militarization of drug law enforcement, as well as on the parallel criminalization and persecution of undocumented immigrants. The testimonies and speeches sought to further public understanding that U.S. is financing and arming both sides of the war in Mexico—and scores of civilians are caught in the crossfire. Maria Herrera in Arizona. She has lost four sons to the violence in Mexico. Departing Houston, the Caravan left the formerly Mexican territory of the United States, and began crossing the history-laden South, stopping in Jackson, Montgomery, and Atlanta. Traversing sacred grounds of civil rights struggles, the Caravan explored the sinister historical roots of the war on drugs and its impact on African American communities. 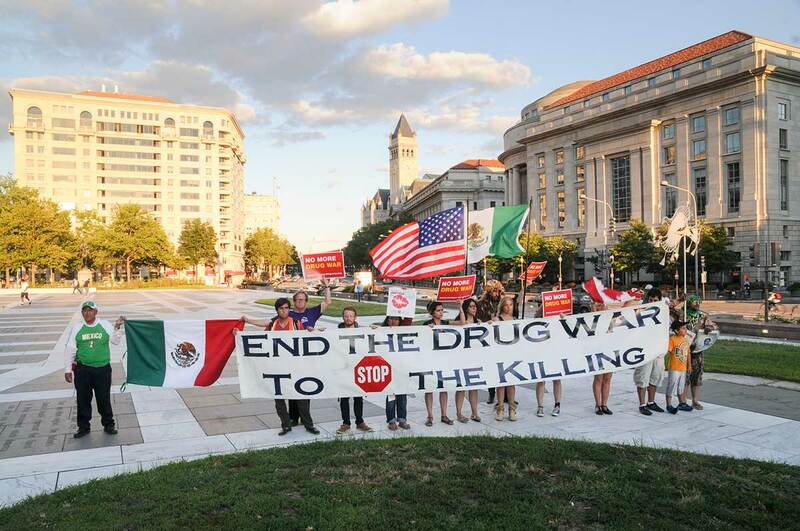 In the last phase of its journey, the Caravan headed north to Chicago, Cleveland, New York, and Baltimore, before arriving in Washington, D.C. on September 10 where it delivered its final, resounding message to North America: end the drug war.